This shop was compensated by Collective Bias, Inc. and The Fresh Market. The recipe, ideas + opinions are mine alone. #MyTFMValentine #TheFreshMarket. This content is intended for readers who are 21 and over. This meal is fit for your King or Queen this Valentine’s Day. I made this meal for one person and one person only…my husband. He works so hard and does so much for me and my family. His favorite meal? A nice, juicy ribeye steak cooked medium rare. Valentine’s Day is also a big deal for us…it is the anniversary of when he asked me to marry him. I am a firm believer that the best meals are created at home. This one is no exception. With the help of The Fresh Market we are able to create a special dinner at home with the finest ingredients. I mean this cut of beef speaks to my heart. Find your The Fresh Market store here. To prepare our Sweetheart Ribeye we simply seasoned this beautiful cut of meat with sea salt and black pepper. Then it was quickly seared on a hot grill to medium rare. Hard to mess with perfection! 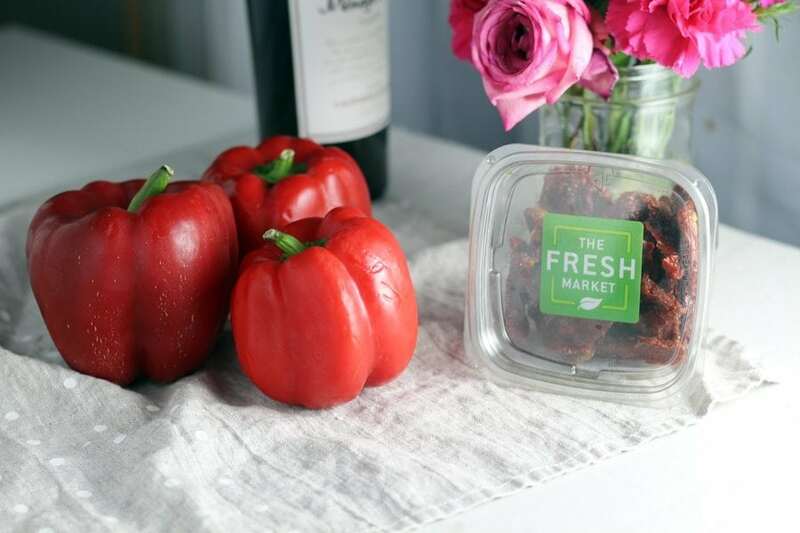 From seasonally fresh produce to exceptional meat and seafood, signature baked goods and carefully curated organics, all the foods you love are waiting for you at The Fresh Market. This entree is a Premium Choice Sweetheart butterflied ribeye that is hand cut for you by The Fresh Market butchers. We like to call it Love at First Bite. Click here for more ideas on a romantic Valentine’s Day at home. 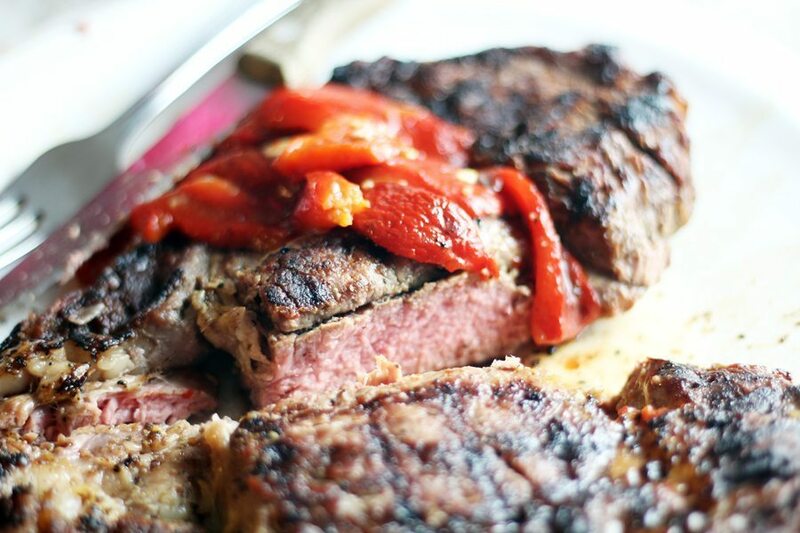 To make this ribeye extra special for my husband, I wanted to create a special steak topper from roasted red peppers. 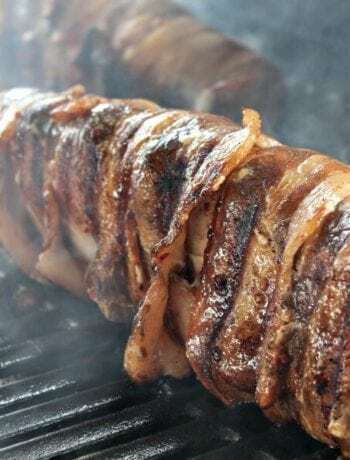 Turn your broiler on high. Place the red bell peppers on a baking sheet and pop them in the oven. Let the peppers blister and char. You need to rotate them every 3 or 4 minutes. Be sure to broil the top and bottom, too. Once the red peppers are roasted all the way around (they will be black, no worries), toss them in a bowl and put a lid on the bowl. Let them cool completely. Carefully peel the skins away from the peppers. They will slip right off. Remove the seeds and stem from inside the peppers. Now, let the roasted red peppers marinate for at least 30 minutes. The Fresh Market also has fresh flowers and a wonderful wine selection. 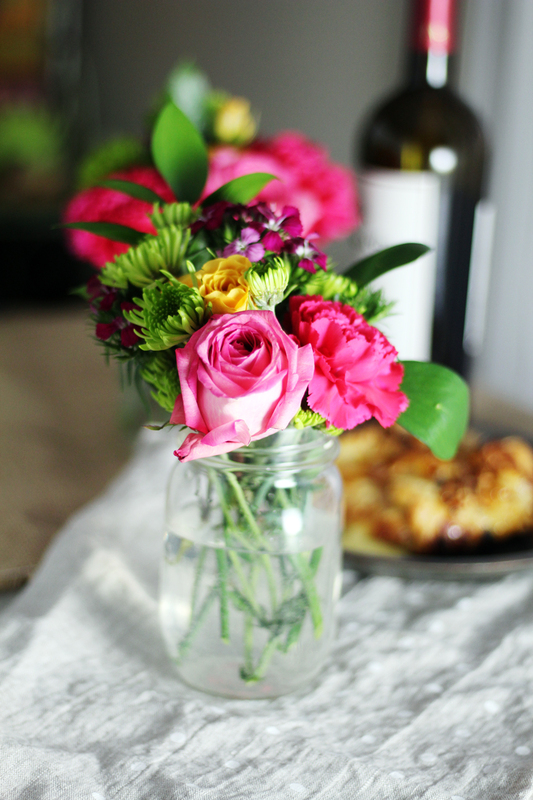 You can’t have a romantic evening without flowers + wine, right? 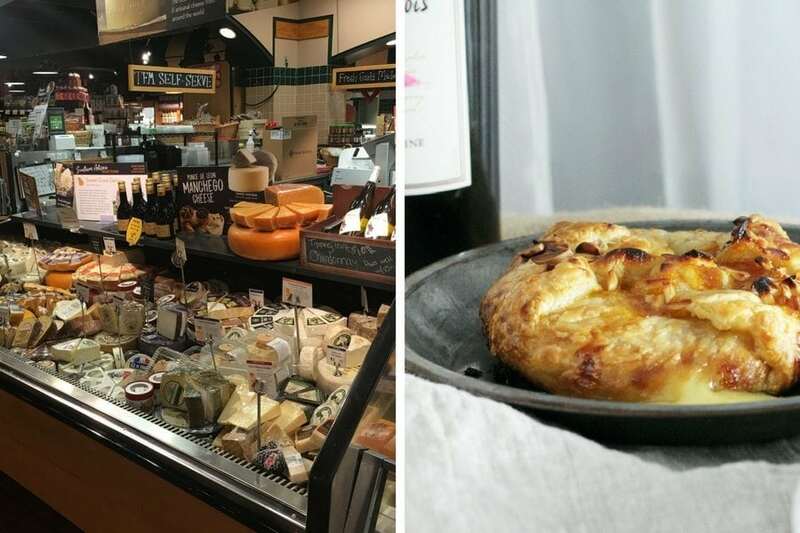 While the peppers are marinating, enjoy the Take + Bake Brie from your trip to The Fresh Market. Wrapped in pastry and topped with almonds and apricot jam, this ooey-gooey appetizer is the perfect starter. Looking for more special Valentine’s Day Ideas? The tender sweet and savory peppers are a simple topping that is irresistible. Plus the marinating sauce of wine and olive oil is an excellent sauce on the steak. Delicious! How are you celebrating this Valentine’s Day? We would love to hear your favorite special recipes in the comments below. A delicious sweet roasted red pepper topping or side dish. Made with sweet bell peppers that have been charred, marinated in olive oil and red wine. ers in a baking tray and place under the broiler. Roast the peppers until they are charred and blisters. Turn every 3 Minutes to cook on all sides. Total time is approximately 15 Minutes. Peel the charred skin away from the peppers. Remove seeds and stem. Slice the peppers into strips or bite sized pieces. Toss with remaining ingredients. Let marinate for at least 30 Minutes. That ribeye is perfect – such a great meal for valentines day! Those peppers look superb! My husband’s favorite meal! Thanks, the peppers turned out fabulous. 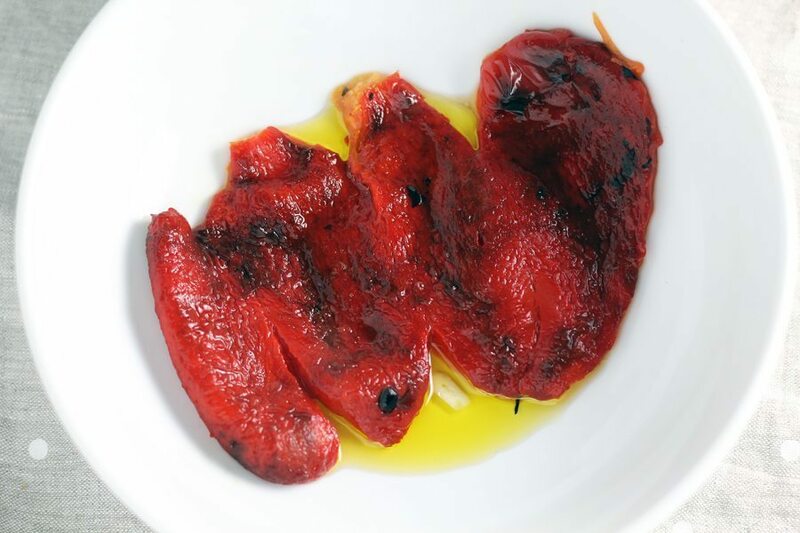 Perfect tutorial for making roasted red peppers. 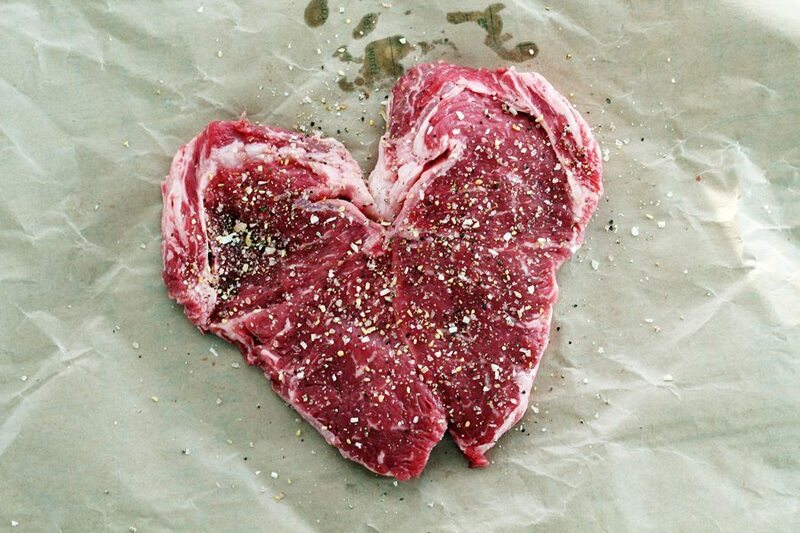 And that heartshaped steak couldn’t be any cuter! I love these peppers, I hope you have a chance to try them. Thank the butcher’s at The Fresh Market for the heart steak. Too cute! 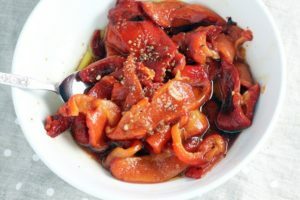 What a lovely idea to roast the peppers until charred and then marinade them. I can’t wait to try! Thank you, Kate! 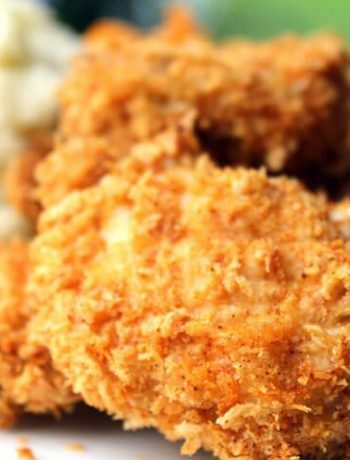 Hope you love them, so easy and delicious. I want to eat at your house! That steak looks awesome! 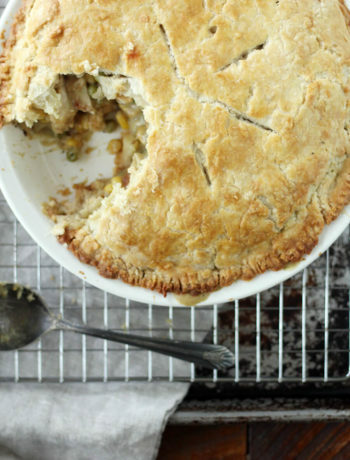 This truly looks like the perfect date-night-at-home meal! I totally agree with you that the very best meals happen at home, and also love making special dinners for my hubby. I probably need to do it more often – hard with a toddler around, as I’m sure you know! 🙂 But this one is worth pinning and making time for for sure!